There's a new pirate in town. 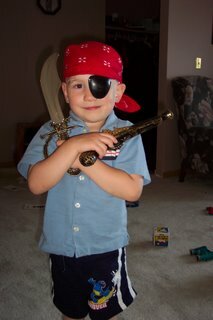 Jude's favourite movie recently is "Hook", so yesterday I bought him pirate gear at the dollar store, stuck a bandana on his head, and he's in little-boy heaven. We also rented "Return to Neverland" yesterday. This morning, he was wanting to watch any movie that is even slightly pirate-related--VeggieTales Jonah, Ultimate Silly Songs (both with The Pirates Who Don't Do Anything), even Lyle the Kindly Viking! As I type, I can hear Jason giving Jude lessons in how to say "AAARRRGH!!" And sword fighting. Being a kid is so much fun.